A province in the northwest of Asia Minor, adjoining the Propontis, the Thracian Bosporus, and the Euxine. A Jewish colony existed there as early as the first century of the common era. In his address to Caius, the Judean Agrippa speaks of the Jews of Bithynia (Philo, "Legatio ad Cajum," § 36; ed. Mangey, 587). A Greek tumulary inscription bearing all the characteristics of its Jewish origin was discovered in 1891 at Arnaut-Keni in Bithynia. It runs as follows: Ενθάδε κατάκείται Σανβάτις, υἱὸς Γεροντίου πρ[εσβυρου], γραμματεής ("Here lies Sanbatis [= Shabbethai], son of Gerontios, presbyter, scribe, and president of the elders. Peace!"). It is thus evident that organized Jewish communities existed not only in the important cities, like Nicæa and Nicomedia, but also in the small towns. These communities, like all those of the Byzantine empire, underwent many persecutions during the Middle Ages. 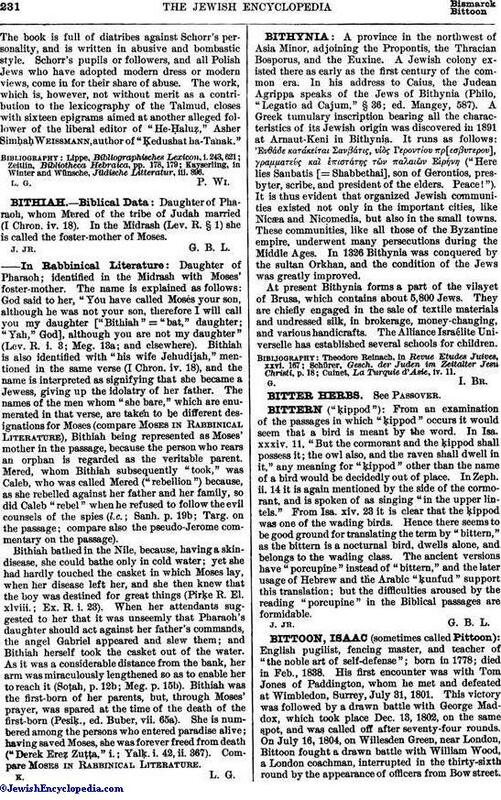 In 1326 Bithynia was conquered by the sultan Orkhan, and the condition of the Jews was greatly improved. At present Bithynia forms a part of the vilayet of Brusa, which contains about 5,800 Jews. They are chiefly engaged in the sale of textile materials and undressed silk, in brokerage, money-changing, and various handicrafts. The Alliance Israélite Universelle has established several schools for children. Cuinet, La Turquie d'Asie, iv. 11.